There are many treatment options available when it comes to dentures. 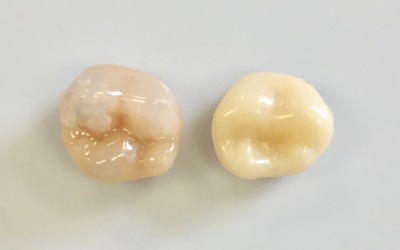 We work closely with your dentist to achieve the results you require and use the latest techniques and technology to produce high quality, durable and aesthetically pleasing dentures. 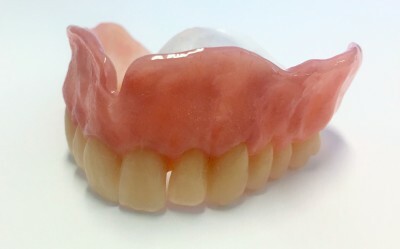 This is our entry level denture. It is available on the NHS and is aimed at patients where cost is a priority. The denture will fit comfortably and function well. We use a natural looking veined acrylic. The denture will not be customised and will therefore have a smooth gum appearance. This is our independent equivalent which is more resistant to stain and wear. We use a high impact veined acrylic base which will be customised by stippling and contouring to give a more natural appearance. This is our private equivalent premium denture which has enhanced natural appeal, high resistance to wear and tear and detailed customisation. 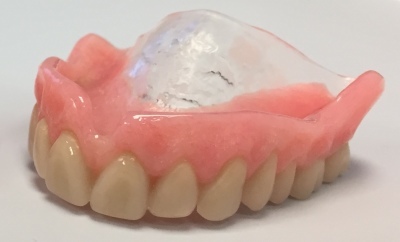 This denture uses a premium tooth and a ultra high impact natural veined acrylic base. Gum/Flange Staining - match your natural gum tissue. Chrome dentures are an alternative to the usual pink acrylic dentures. They are less bulky, better for your oral hygiene and can be more comfortable. In certain designs we are able to have an open palate allowing taste and hot and cold detection to be improved. However chrome dentures are more expensive to make and are not suitable for all cases. Your dentist will advise. These are constructed from Wironium, a very strong alloy. Wironium is nickel and beryllium free. Constructed from Vitallium cobalt chrome which has unique physical properites in terms of strength and flexibility enabling the technician to design strong, aesthetic, versatile frameworks. Vitallium alloy is the premium cobalt-chrome partial denture alloy that maintains a high luster and will not tarnish or corrode. This alloy is also nickel and beryllium-free.